Right from the hushed opening bars it is clear that this music was conceived directly for the orchestra, not at the keyboard. Liszt’s skill in producing a viable concert work is therefore all the more remarkable, and he catches all the key moments with their orchestral emphases. The succeeding Molto vivace comes off more consistently successfully, its dancing lines and textures brilliantly delivered by McCawley and Wass. They are technically even more impressive in the variations of the Adagio molto e cantabile thought the tempos are exceptionally swift. No issues, though, with the complex finale- also taken at a fair lick- where the vocal lines are assimilated into the musical textures to perfection. Both players’ touch here is superb (in the famous ‘Ode to Joy’ theme especially) and brings to life what might otherwise have been dry and merely worthwhile. With Liszt’s transcription of Beethoven’s Ninth, the partnership of Leon McCawley and Ashley Wass responds to the considerable challenges with enthusiasm, stamina and assurance. Their interpretation of the opening movement comes across as an epic journey through music of absorbing grandeur. The joyously melodic and satirical drama of the Molto vivace is given a performance of spirit and exhilarations. I loved the way the oceanic emotional depths of the Adagio were conveyed as a sublime outpouring of exaltation. The players set the pulse racing with the unconfined joy of the triumph and glory of the Finale. Throughout I was struck by the feelings of intense turbulence, high drama and energy, laced with rapture, combined with a sense of spiritual conviction for this wonderful music. 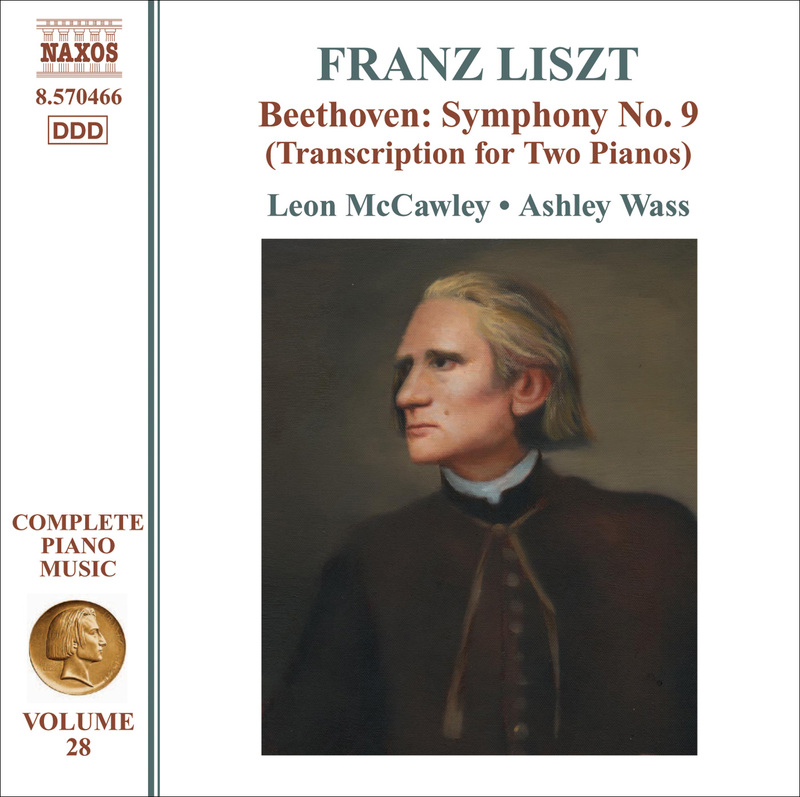 This two-keyboard version of the Ninth from 1851 is fascinating, and Leon McCawley and Ashley Wass show how dramatic it can be, and how acutely Liszt was able to translate the orchestral scoring into plausible piano sonorities. It’s engaging and superbly played, and, at the price, worth it for the novelty and the unexpected revelations. Beethoven’s Ninth on two pianos is not at all the same thing, even when the transcription (masterly) is the work of Liszt. On the other hand, details of harmony and pitch (the timpani’s F at the beginning of the scherzo) spring out afresh. And the performance (at Beethoven’s metronome speeds) is so vivid and powerful that you are carried along by the exhilaration of it, and your ear gradually suppiles what is missing. Although Liszt’s solo-piano arrangement of Beethoven’s Ninth Symphony certainly is a virtuosic tour-de-force, his two-piano transcription more successfully addresses the score’s large dimensions in terms of textures, dynamics, color, and, in the finale, more audible distinction between choral and orchestral forces. Leon McCawley and Ashley Wass team up for its finest recording to date. Their headlong drive in the first movement evokes Toscanini’s archetonic ferocity. The pianists underline harmonic clashes and contrapuntal felicities by way of color shifts, accentuation, and nuance rather than tempo fluctuation. The same goes for their soaring Scherzo (with both repeats intact), where the obsessive dotted rhythms are consistently supple and accurate. While the duo maintains rigorous tempo relationships over the Adagio’s brisk course, they avoid rigidity by way of discreet rubatos and tasteful lyrical inflections. It is not easy for two-piano teams to sustain long, loud episodes without forcing tone or losing rhythmic steam, yet McCawley and Wass wield the proverbial iron hands in mink gloves in their tightly knit, unified Finale. The sonics are slightly too resonant and bass shy, but the instruments are as well matched and balanced as the pianists. I hope Naxos already has enlisted these artists for Liszt’s two-piano version of A Faust Symphony. Highly recommended.